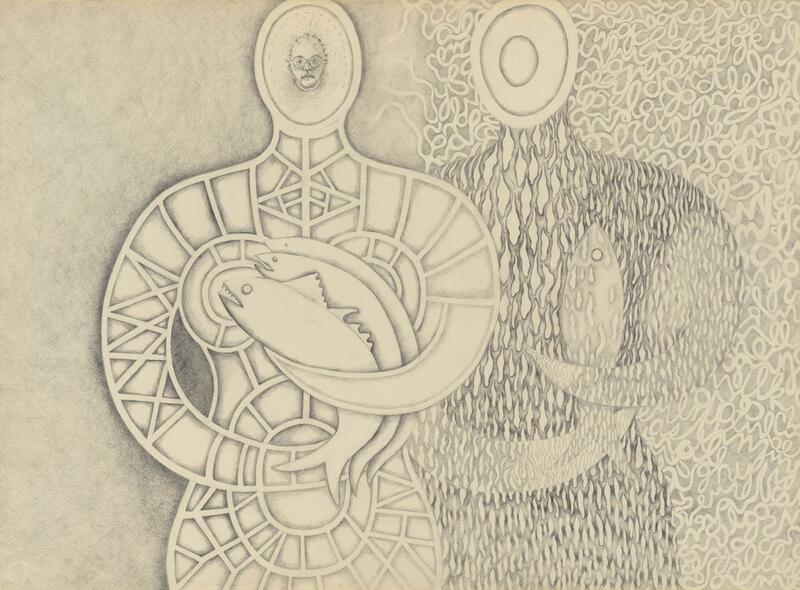 Suellen Rocca, "Double Figure with Fish," 2000, courtesy of "Document Journal"
Suellen Rocca (BFA 1964, HON 2016) was interviewed recently by Ann Binlot for Document Journal on her work with art collective the Hairy Who and the inspiration behind her work and featured in Hyperallergic with an in-depth piece detailing the development of her work as it aligned with her life. Rocca’s work is currently being shown in three exhibitions: A selection of her drawings are at Matthew Marks in New York through October 27; her work from the ‘60s is on view at the Art Institute of Chicago in a Hairy Who group exhibition until January 6, 2019; and she’s curated a show of the Chicago Imagists that is showing at the Elmhurst Art Museum through January 13. However, not all of her work came from a place of joy. Hyperallergic's feature walks through the development of Rocca's vision and inspiration, good and bad. For example, when Rocca was married the artist’s work “used abstracted, intimate forms to create a personal iconography — often in hieroglyphs of repeating elements — that elicits a sense of pleasure in romance, female sexuality, and domestic life.” After Rocca's divorce, the artist reflected on advice she received from her SAIC teacher Ray Yoshida, who emphasized using one’s own voice in the artwork. “Rather than sidestep her emotional suffering, she took a full accounting of it, and it transformed her art,” reports Hyperallergic. Rocca continues to advise a generation of new artists to continue to look at work, go to exhibits, and visit museums to be inspired by the art in person. Read Document Journal’s online piece for an interview with the artist, and Hyperallergic online for a detailed history of Suellen Rocca’s life, inspiration, and art.